I'm wild about the items she chose to highlight: a four-color pen, a smart necktie, and a few perfect Fair Finley dresses. 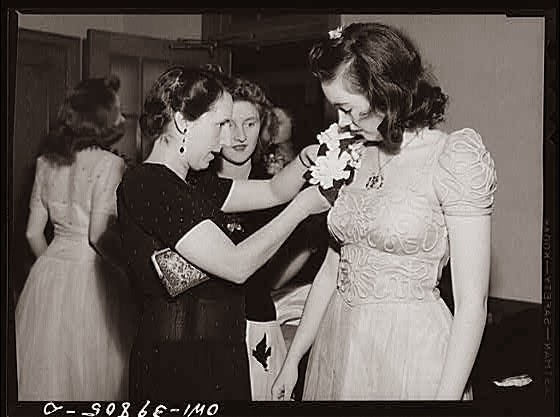 "I see Fair as a gardenia-corsage-type-of girl." Thank you, Bess! I enjoyed your Wilfair style page v. v. v. mucho. And I'm wild about the scent of gardenias, and how that heady perfume can trail you all night, if they're pinned to your shoulder in just the right place. Actually, this young lady is quite Fair. Is she your Fair, too? Hey now! Ha! I almost forgot that I made this board. I had to update it with an important bathing suit that is Wilfair-ian in nature just now. Gardenias! i love so much. We had a bush of them in the yard of our old house and the lovely scent would just hang in the air on hot days. Well done, Miss Bess. I love the Rita Hayworth pic. And the bathing suits. Please tell me you own/will soon own at least half of them! Do dah, I do have the cherry print one and it's the best bathing suit I've ever owned.